Aruban authorities will today reconstruct the movements of missing tourist Robyn Gardner, the U.S. woman who disappeared while on a trip there with a man she met on an online swingers' website. The man, Gary Giordano, 50, is being held by police in Aruba while they investigate whether he was involved in her disappearance. Authorities will use eyewitness testimony, surveillance video and new photos of Gardner to re-enact what might have happened. The photos of Gardner show her partying with Giordano in Aruba two nights before she disappeared. In one of the photos, she's with Giordano, and in the other, she's standing by herself. 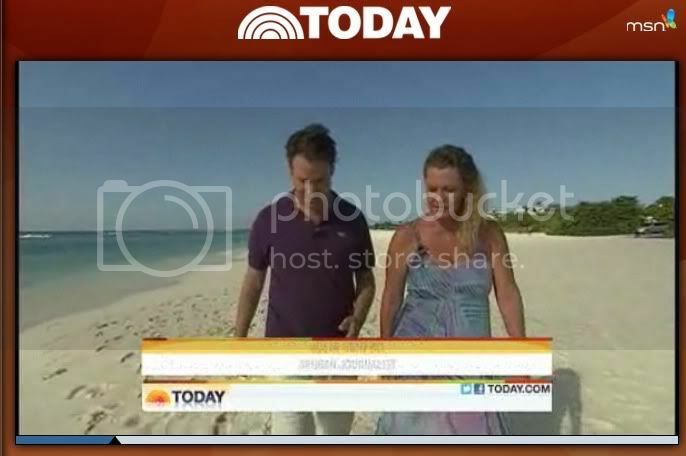 In the photos, obtained exclusively by ABC News, Gardner is wearing the same ankle-length dress she wore the day she vanished from an isolated jetty. Gardner, 35, has been missing since Aug. 2. Giordano has told authorities that the two went snorkeling and that the Maryland woman was swept out to sea by a strong current. The two were in the midst of a weeklong trip to the Caribbean. Giordano of Gaithersburg, Md., has denied any wrongdoing in connection with Gardner's disappearance. The re-enactment will happen between 4 and 6 p.m. – around the time of day that Gardner apparently vanished. The whole key of re-enactments is to try to go back and first of all understand and be clear about the movements of people prior to a criminal act occurring," retired FBI profiler and ABC News analyst Brad Garrett said. "Now, unfortunately, in this case you don't have a crime scene to eventually end your re-enactment." Investigators have so far found no direct evidence linking Giordano to a specific crime. "Good Morning America" has learned that at least two eyewitnesses are expected to participate, but Giordano will not. Giordano has refused to cooperate, according to multiple sources on the island. Garrett said the re-enactment might also give authorities "a better view of inconsistencies" in Giordano's account. Giordano and Gardner arrived at the Rum Reef Bar & Grill at Baby Beach around 3 p.m Aug. 2. They stayed for an hour, then left for the beach. Shortly after 6 p.m. that same day, Giordano reappeared on security cameras. He was shirtless but was still wearing his toupee. Witnesses have previously described him as eerily calm in the initial hours after Gardner vanished and said that his clothes weren't dripping with water like he'd been frantically searching for someone. They also told investigators that they saw blood on the beach and said Giordano had a cut on his throat. By the time Giordano reached the restaurant, it was closed. Giordano told investigators he was trying to get help, rouse someone from the restaurant. The surveillance video shows him crisscrossing the restaurant from the bar to the patio and going around back. He appears calm. Investigators said that it appeared that Giordano wanted to be visible on every camera at the restaurant as if to establish an alibi. Still wearing his toupee just after snorkling? Doesn't sound right to me . How do they stay on, glue? Waterproof glue? I either heard this on GMA this morning or saw it on an ABC video, the authorities in Aruba waited four weeks to send Robyn's IPAD and some blood evidence for testing. I'll try to find it later when I have more time. It seems odd to me that Robyn has the same dress on in every picture and video that we've seen. Did she wear the same dress all three days she was there? I would like to see the Aruban Investigators ask if anyone noticed boats in the area that day? Wonder if they have interviewed the fisherman who said he saw Robyn and Gary on the Beach? Wonder if there are any aerial photos from helicopter tours? Seems to me, if you had an accomplice to help you "get rid" of someone, or a dead body for that matter, it would be smart to hire an accomplice with a boat. Why did Giordano take Robyn to the end of the island closest to Venezuela for snorkeling? Why not stay near the hotel and the "white sand with umbrellas and drinks" tourist beaches? IMO, Robyn looked more like she was ready for a photo shoot than snorkeling. Long dress and Platform shoes on a rocky beach? Looks like she even did her hair. She wasn't going snorkeling. Hey Mr. Baez, how many times has Giordano traveled to Aruba? Was this his first visit? Just when we thought we wouldn't have to listen to that windbag anymore, Baez is back on the morning circuit. Thanks for all the news, monkeys. Thank you, TM. I know Robyn didn't wear that dress the whole time she was in Aruba. Did anyone see Robyn in any other outfits? Like a pair of shorts? Or by the pool? She doesn't look like the kind of girl who even gets her head wet at the pool. Any surveillance from the hotel where they stayed? Mighta been her bathing suit cover up thing? I think I read here or somewhere that she had hair extensions and that she probably wouldn't swim in the ocean much because of them and the amount of make up she usually wore. Why go to a beach resort with that much restrictions on having fun in the water? o.k. found it, it's at the very end of this video...he specifically said that they'd just found out yesterday that key forensic evidence including Robyn's Ipad and "blood stains" had not been sent for analysis until two weeks ago; four weeks after Robyn's disappearance. all in the same clip! Another thing that kind of hits me weird about this case is the lack of outrage or comments from her family. Her boyfriend that was at home has spoken out a lot but I don't recall brothers/sisters/mother/father saying too much. Maybe they did at the beginning and I missed it. Robyn's brother started the FB page for her, and has had a couple very short interviews (with his face hidden). I'm thinking that Robyn's father is not in good health (maybe posted on Robyn's facebook page) ; that's why her mom traveled to Aruba with either a cousin or friend of Robyn's a couple days after her disappearance, but he didn't go. Andrea Colson, Gardner's mother, issued the statement one day after island authorities called off the search for the 35-year-old woman. "We can only pray that she will soon be with us and bring back the joy into our lives. She means the world to us," Colson said in a release. "We are hoping for the very best outcome with the help of the international community." "We are confident and very grateful to the Aruba authorities and volunteers who are working above and beyond all our expectations," she said in a statement circulated by The Natalee Holloway Resource Center. "I hope you understand that we are being quiet as to not jeopardize the investigation. Please continue to pray for Robyn. Thank you." I'm not sure if this is right or not, but I got the impression the brother was afraid of what Giordano might do if he was released at the time of his interviews. Thank you TM! I really appreciate how smart and on top of it you and everybody else is. Glad to know that Robyn does have family and I hope that their trust in the Aruban system is rewarded. I'm not so sure about that. I am deeply disturbed by the information I have received directly by not only one of Robyn Gardner's intimate friends - but SEVERAL, in fact. They have each relayed the EXACT same data - not knowing any of the others had ALSO contacted me on their own with the same set of marked details. Without me saying one word - because I was stunned by what they said next - EACH ONE believed wholeheartedly and KNEW that Richard Forester was the one responsible for "Robyn's broken arm" and was also the one who administered the "mystery" bruises. I had ABSOLUTELY NOTHING to do with these statements originating from Robyn's intimate close ones. NOTHING. But I felt if even one shred of this was the truth ... I had to at least come forward in this unique instance. May God help him if this is so ..
YW mizjay, I'm not so sure about either. But I can't blame her family for being cautious, I can't bear to imagine...and hope I never have to walk in those shoes. Why the complaint? Lopez should have encouraged Gary to participate and direct the re-enactment. ORANJESTAD, Aruba -- A lawyer for a U.S. man detained in Aruba is criticizing prosecutors' re-enactment of the purported drowning of his client's travel partner. Defense lawyer Michael Lopez says Monday's re-enactment was "one-sided" because authorities ignored some of Gary Giordano's statements about what happened to 35-year-old Robyn Gardner. Lopez also complains he wasn't allowed to videotape the exercise. It was Gary Giordano's choice not to co-operate in the reinactment. ORANJESTAD, Aruba(AP) A lawyer for a U.S. man detained in Aruba is criticizing prosecutors' re-enactment of the purported drowning of his client's travel partner. Blood and ipad sent for forensic tests two weeks ago because of budget cuts. Aruban authorities are retracing missing tourist Robyn Gardner's last steps. Page created in 6.23 seconds with 20 queries.